I know that given the high quality of hairdryer excommunication releases, most notably on the packaging, that you (my dear listeners) may be under the impression that we have a team of experienced designers, cutters and stickers. However, this is not the case. As this picture shows, it is a one person merry-go-round: all typing, all stamping and all dubbing goes down solo. 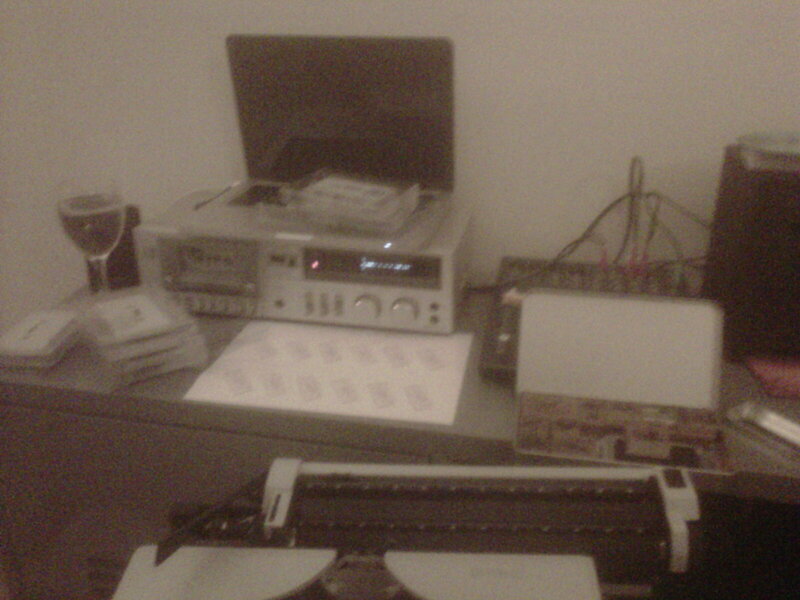 This is a work in progress of the first Dead Wood / Phantom Heron Seas collaboration cassette. Following their lathe on Dirty Demos and their 3″ cdr on Dead Sea Liner, these two mystical shed-dwellers have brewed some seriously organic death knell here. Honestly, the leaves on the lilies burst to life and then slowly wilted right in front of my eyes when they came across these sounds. Utterly brilliant stuff. It should be ready to be procured by May. Rest not, dear listeners, I’ll keep you posted.